Are you a fan of bone broth but hate that it takes so long to make? Did you get an Instant Pot for christmas and want to put it to good use? 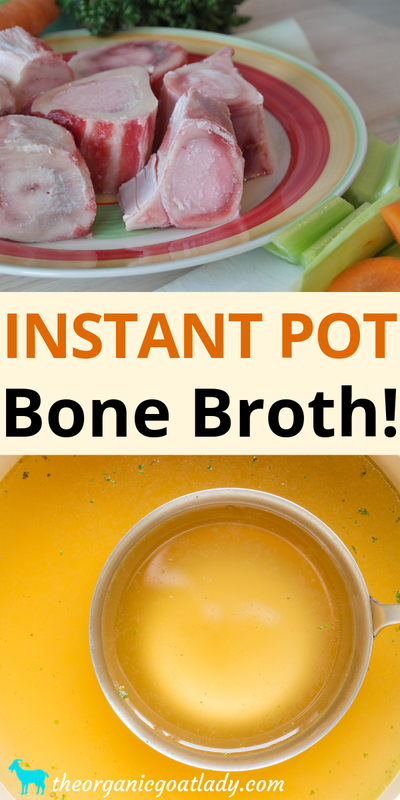 If you answered yes to either of these questions then you will love this recipe for instant pot bone broth! I am a big fan of soup. And not just because I love to eat soup. My true love for soup is due to the amazing health benefits that come from making homemade soup with nutritious bone broth! Well, that and the fact that a giant pot of soup will feed my family of six for multiple meals and still leave us leftovers to freeze for later;) Nothing makes me happier than a giant pot of soup! Am I right?! But the main reason, like I said, is due to the amazing nutrition that can be found in bone broth. Bone broth is not only a must during times of illness, but it is a great way to get the minerals we need and to help nourish the gut and strengthen the immune system. A friend of mine once told me a story that her grandmother used to tell her. The story was about a mean stepmother that favored her own child over her step children (kind of sounds like cinderella I know;). The stepmother would cook meat on the bone and give the meat to her own child while making the step children eat only the broth that was left. However, the step children flourished and were healthier than her own child due to the amazing nutrients that they received from the bones that the broth was made from. What makes this story even more awesome, is that my friend’s grandmother knew that the broth made from bones was healthier before scientists did;) People have been eating bone broth for centuries and experiencing the benefits from it! So, we know that bone broth is good for us. But how do we make it? You might already make your own bone broth in a crock pot. That is the way that I’ve done it for years! And it really is an easy way to do it. So if you don’t have an instant pot don’t worry, you can do it in a crock pot and end up with a super nutritious and delicious broth! The only problem with making bone broth in the crockpot though is that it takes FOREVER! When I make bone broth in the crockpot it has to cook for anywhere from 24 to 48 hours depending on what kind of bones I’m using. I’m going to be honest here, I probably make bone broth a lot less than I should for no other reason than that I don’t always have the time to cook bones for that long. I always have ambitious goals of drinking a mug of bone broth every morning for breakfast, or having a large supply in the freezer to use whenever I need it. I’ll make a big batch and then once it’s gone I have some excuse for not making more. It can really be a pain to calculate what I’ll be doing in 48 hours to make sure that I’ll be home to strain and put bone broth in jars. Or what happens is that I decide one morning that we should have soup for dinner….only to discover that I have no bone broth in the freezer! And of course I can’t make bone broth in the crockpot in time for dinner! It wouldn’t be ready! So I either decide to make something else or buy store bought broth (gasp!). I know!! This is why I am in LOVE with my Instant Pot! I mean, there are many many reasons that I love my Instant Pot, but this is one of the biggest reasons of all! I can make nutritious bone broth in two hours!! Yes, you read that right….TWO HOURS! You might be wondering how can this be? Surely It can’t be as nutritious? I mean come on, it’s just a pressure cooker, not magic! To make your instant pot bone broth start by gathering your ingredients. To make a basic bone broth all you really need is bones, water, and apple cider vinegar. That’s right, bone broth doesn’t have to be fancy;) Honestly that is all I put in my bone broth most of the time. However, to give your bone broth a more delicious flavor you can add some herbs, vegetables, salt and pepper. This is a great way to use up your veggie scraps instead of throwing them away. Next time you have some veggie scraps left over from cooking, throw them in a ziploc bag and put them in the freezer for your next batch of bone broth! Some additional items that go very well in bone broth are: carrots, onion, celery, salt, peppercorns, garlic, etc. Really you could use any herb that you like, but these are some of the most common additions. Once you have all of your ingredients together you’re going to add them to your pot. Add about 2.5 – 3.5 pounds of bones, a couple roughly chopped carrots, a couple roughly chopped stalks of celery, an onion cut in large chunks, salt, and maybe a couple cloves of garlic. Then add the filtered water. Fill the water to about an inch below the max fill line in your instant pot. Also keep in mind that the more veggies you add to your broth the less water you can add. This means that the amount of broth you end up with will be a little less if your pot contains a lot of veggies. When I make bone broth without any added veggies or herbs I end up with about a gallon of broth. You’ll probably end up with about half of that after adding veggies. However, as I mentioned above, veggies do add wonderful flavor. And of course as quickly as this bone broth is made in the Instant Pot, you can make more as often as you’d like! Now, you can use whatever types of bones that you would like. Beef, chicken, lamb, deer, these are all good options! I personally use a lot of deer, lamb, and chicken bones to make broth and they each taste amazing! If you are using big bones such as beef, lamb, or deer however, you might want to use roasted bones. This will also enhance the flavor of your broth. To do this simply place your bones on a baking sheet and roast in the oven at 350 degrees for about an hour. Then transfer to your instant pot and proceed as above. This is not a mandatory step. I’ll be honest, I don’t usually do this as I’m usually in a hurry. I find that my bone broth turns out really well and tastes amazing even if I don’t do this step. After all of your bones, veggies, and water are added you need to add a tablespoon of apple cider vinegar. This is an important step as the apple cider vinegar helps to draw the nutrients from the bones. So while it’s ok to skip adding veggies, or roasting your bones, don’t skip this step! It’s important. After everything has been added to your pot put on the lid and turn to the locked position. My Instant Pot has a soup/broth setting that I use. I select the soup/broth setting and then choose high pressure. If yours does not have this setting then select “manual” and high pressure. Set the timer to 120 minutes. It will technically take closer to three hours total as the pressure cooker will have to preheat and then will also have a cool down period. Let your Instant Pot release naturally before removing the lid. The broth will be extremely hot so I usually let it sit for just a bit before removing from the pot. The final step is to strain the broth from the meat and veggies. Discard the meat and veggies and add your broth to glass jars. I like to use canning jars. Allow to cool before storing your jars in the fridge or freezer. Be sure not to fill your jars too full if you plan on freezing them, as they will burst as the broth cools and expands. You can also freeze bone broth in ziploc freezer bags if you’d like. And that is how you make bone broth in the Instant Pot! I know that once you make a batch of broth in your Instant Pot that you will be hooked! Do you have an Instant Pot? If not you NEED one in your life! You can find the exact model that I use here. This model has it all! It is the bigger size, which is essential if you have a large family or if you like to have plenty of broth left to freeze. And it has sooo many different features that some models do not have. It has a rice setting, a yogurt setting, a steaming setting, an egg setting and so much more! In case you haven’t noticed I’m in love with my Instant Pot! It saves me so much time and allows me to feed my family nutritious meals even though my time is limited. Trust me, you will love it too! Also be sure to come back after making bone broth in your Instant Pot and let me know how you like it? Was it a big time saver? Did it taste amazing? I can’t wait to hear about your experience! 10 Amazing Kombucha Flavors That You Will Love! This is the easiest way to make nutritious bone broth and the fastest! 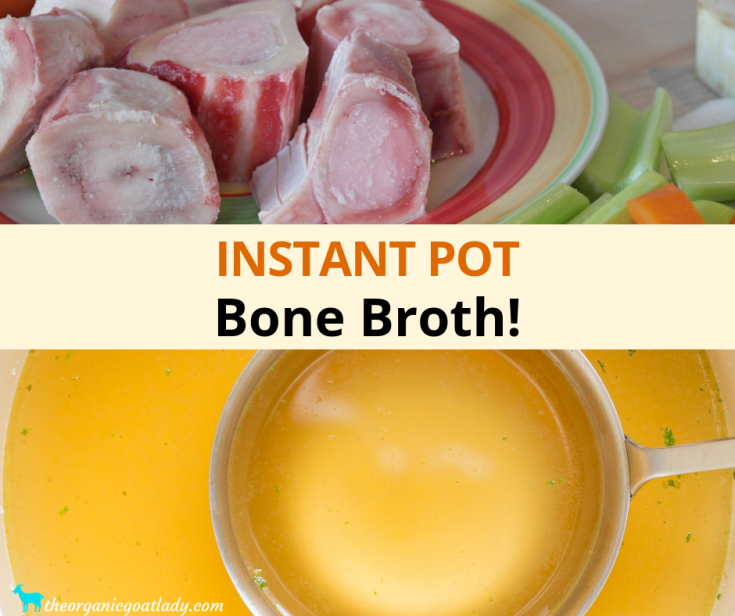 If you have not tried to make bone broth in the instant pot you definitely should! Add bones to pot. If using large bones such as beef, lamb or deer refer to post for optional roasting instructions. Roughly chop optional veggies and add to pot. Add water to an inch below max fill line in Instant Pot. Add seasoning and apple cider vinegar. Lock lid in place. Select Soup/Broth setting and high pressure. If you do not have a Soup/Broth setting then select manual and high pressure. Set to 120 minutes and start. Allow pressure to naturally release when done. After it has completely released open lid. If too hot allow to sit for a few minutes to slightly cool. Strain broth from bones and veggies into glass jars. Refrigerate once cooled. You can also add to ziploc freezer bags once it has cooled and freeze for future use. Discard bones and veggies. Be sure to read the above post for additional tips and info.